This is our footage of Nate Phelps’s speech at the Reason Rally. Although we managed to get an outstanding interview with him for the documentary and filmed his recent stirring ReasonFest 2013 presentation, this speech still stands for us as a truly remarkable piece of oratory, and its message should be heard again and again, by many. We always wanted to post it all at a blog, so here it is from the movement’s biggest stage to date. 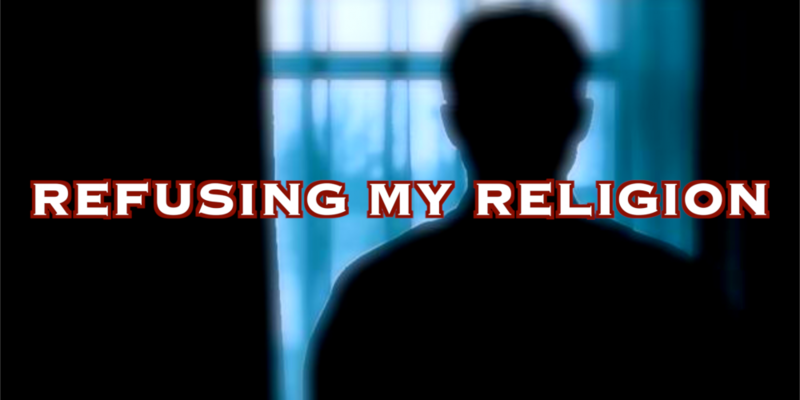 REFUSING MY RELIGION attended ReasonFest 2013 in Lawrence, Kansas. Orchestrated by Amanda and Adam Brown, the entire event was wonderfully thought-provoking, informative, and socially engaging. The impressive roster of speakers and panels was not to be missed as part of our film’s reportage on America’s current religious climate. The cameras were rolling nearly non-stop and we had the truly awe-inspiring experience of interviewing Nate Phelps. We’d met Nate at the 2012 American Atheists Conference and Reason Rally in D.C. and we were thrilled to catch up with him in Kansas. Notably, it took place not too far from where he spent much time growing up the son of Pastor Fred Phelps, founder of the infamous Westboro Baptist Church. Nate is undeniably one of the greatest spokespersons the secular movement has. The quiet, dignified delivery from such an imposing figure conveys both composure and a powerful expression of truth one cannot help but absorb. He doesn’t have to do much to make one feel deeply moved by what he has endured. The crowd hung on his every word and many were tearful. As an acting student I had the great fortune of learning directly from David Mamet and Bill Macy through the Atlantic Theater Company. They taught us many lessons about art, human nature and life, including regular reminders that most powerful people don’t need to pound their chests or shout to get others to listen. Nate has this kind of unforgettable and placid presence about him. We would highly recommend seeing him speak if you have the chance. His calm demeanor juxtaposes a horrific childhood against where his life is now, and his journey getting here is nothing less than riveting. He will have you completely enthralled, causing you to reflect upon humanity and the world in which we live in a way that is rarely elucidated so profoundly. We are deeply honored to have him in our film as someone who understands better than most anyone that sometimes finding salvation means losing your faith. He is, to be sure, a great, humble man and we all need our heroes. Nate Phelps is simply there for everyone in just this way. What is wrong with the part is wrong with the whole. When one person suffers, humanity suffers. Throughout the making of our documentary REFUSING MY RELIGION, there have been many moments that have struck Michael and me in the pit of our guts. Many of them have been unanticipated, generated by our pursuit of telling the story of those who live truthfully in spite of its consequences. We find ourselves different since we started on this journey. Our mission is for this post to touch to you in the very same way things hopefully will through our film. This can transform the way we look at the world around us when telling the story of those who continue to suffer and those who have experienced personal victory by coming out as atheists against all adversity. Our travels presented us with several such individuals. One of them has come out and one is still living in secrecy. Hearing their stories was an unforgettable experience. It made us yet again grasp the gravity of this project. One is from Iraq, has come out and has thrived as a humanist activist. His name is Faisal Saeed Al Mutar. Faisal has managed to survive attempts by Islamic fundamentalists in his home country to murder him for his humanist activities. He moved here to the States only weeks ago, having been granted political asylum. Relatively safe now, he can and is continuing to thrive doing what he loves, being a humanist activist, and an impressive one he is. He has founded and runs the phenomenally successful Global Secular Humanist Movement. We are deeply moved by his story and are honored to share it with you in our film. The other we can refer to only as “Muhammad Doe”. Originally from a Middle Eastern nation where there is Sharia law, he is still in hiding somewhere in the states. He is unable to publicly come out as an atheist because he feels that even in this country, there will be those (including his family) who would kill him for doing so. These two stories of men from Muslim countries who are secular clearly represent the personal dichotomies of pastors in the Clergy Project, both those who have unshackled themselves and those who still lay in wait, hiding, desperately looking for a way to “come out”. We also found out that Faisal and “Muhammad Doe” knew of the Clergy Project. They were familiar the names Jerry DeWitt, Teresa MacBain, Mike Aus, and “Adam Mann”. The former ministers in our film who have come out in the Clergy Project have actually inspired these men from the Middle East to do the same. This beautiful cycle is the very mechanism of inspiration. It underscores all of our humble efforts as filmmakers in sharing these stories. We know that in a Madrasa somewhere there will be a kid who hears the words and sees others who have gone first. This might help that kid to summon the strength to live truthfully. Even though we find ourselves many years removed from the end of slavery, the right to sit in a bus where you want to, the right to vote, the Holocaust, and suffrage, the final work of the Civil Rights movement is not done. Not here nor abroad. Amazingly, this world still has profound, infuriating and frightening intolerance of all forms. There is much needed work to be done. We hope this film serves as inspiration to those who fear for their lives because they want the freedom to live reasonably, truthfully. This world deserves tolerance for all who live in it, and we are determined to serve its creation and growth. We strive to increase compassion, awareness and knowledge. Besides, what else is there to do? RMR’s – ‘BEHIND THE CURTAIN’ – Investigated By Cops With Brother Jerry In Rosepine, La. “BEHIND THE CURTAIN” is a backstage glimpse of of our experiences shooting the documentary ‘Refusing My Religion’. We look forward to sharing content as the project evolves. Investigated By Cops With Brother Jerry DeWitt In Rosepine, La. Life is hard for an atheist in DeRidder, Louisiana. Especially if you’re a former pastor who “came out” and is now the ONLY open atheist there, a town of ten thousand with nearly as many churches. Marc and I grasped the gravity of living here for a nonbeliever when we were filming our documentary REFUSING MY RELIGION with Clergy Project member (and its first “graduate”) Jerry DeWitt. Driving peacefully through the unassuming town in January 2013, Jerry guided us to his high school where we pulled over for a figurative stroll down adolescent lane, camera rolling as we sat in our rented car. While Jerry reminisced about the sexual follies to which we all fell prey in high school, we noticed an elderly man repeatedly riding past us on a four-wheeler about 20 yards away. City slicker that I am, I just thought this gentleman was mowing his lawn or going for a late-afternoon joy ride. But by the fourth time he cruised past us, the intrusive noise caught our attention. So after about 15 minutes parked there, we took off and went to visit Jerry’s elementary school a mile away to talk about how children are indoctrinated as a matter of course here and throughout the Bible belt. A few minutes later as we stood outside it, about to film Jerry again, a police SUV suddenly barreled off the roadway and up onto the school’s grassy sidewalk a few feet from where we were standing. A pancake-stack of a man lumbers out of the SUV and approaches us, uniformed and armed. “I got a call from an off-duty sheriff’s deputy about some folks filming something and he thought I oughta go investigate it, so that’s what I’m doing, investigating what y’all are up to.” In his soothing, quintessentially southern manner, Jerry ably takes the reigns and asks how “So-and-so” is doing today. Officer Flapjacks drawls, “Oh, he’s doin’ just fine.” Turns out, So-and-so is the chief-of-police in DeRidder, and Jerry obviously knows him. But that doesn’t seem to impress this implacable agent of law enforcement. So Jerry sallies forth, “We’re just shooting a film, they’re kinda following me around, ya know, and I was tellin’ ‘em a story. I live here, lived here my whole life. I’m Jerry DeWitt.” The stoic pillar of crime prevention, there to humbly serve and protect the citizens of DeRidder from all forms of menace and danger, without looking any of us in the eye, simply snarls at Jerry: “Oh, I know who you are…” After we finished our shoot at the second school, we got back in the car and Marc said, “I’ve never seen a cop before who wouldn’t look you in the eye. Usually they look dead at you to see if you’re high, or messed up in the head, whatever. But that guy, he wouldn’t even look at me.” Maybe Officer Flapjacks understood that he and DeRidder were not being very Christian in their treatment of Jerry.